Using the high quality Scitex Scanner, Pivot Media began scanning film for photographers, local institutions, and other clients in Western Massachusetts, the Pioneer Valley, and beyond. One of the very first scans we made when we purchased our Scitex scanner in 1998 was of a badly damaged 4×5 color transparency of photographer Mark Shaw standing in front of a gray backdrop. 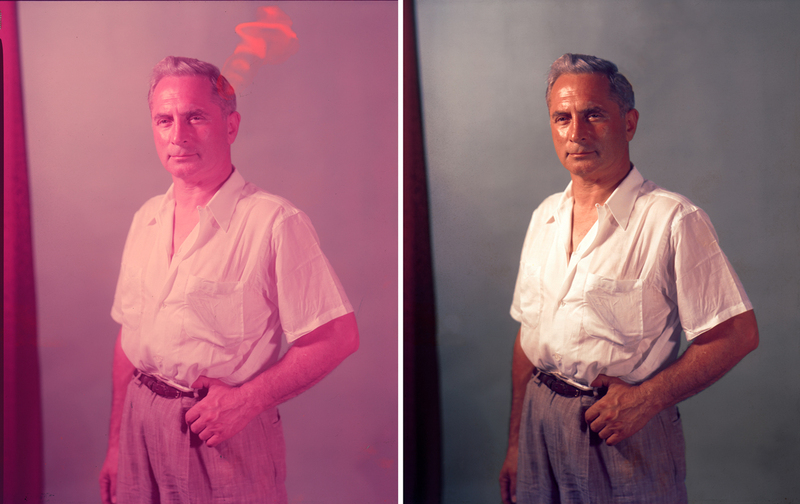 The photo, taken in the late 1950’s or early 1960’s, was almost entirely magenta, a victim of the time and the elements. Our restored version of that image was the first of hundreds of scans we have done for the Shaw Archive from 1998 through 2015.